NEW Code Cheat for FREE Item!!!! So Club Penguin gave out another free code for "Safer Internet Day." I'm not positive about what that is, but at least everyone gets a FREE item for their penguin! You can be a member or a nonmember! So after you log into your penguin, do not click on a server!!! Go to the top right hand corner, and press UNLOCK ITEMS ONLINE. A FREE LAPTOP!!!! Now, you can go online and show all your friends you got a laptop for free! Don't forget to rate this article, and tell us what your favorite free item Club Penguin has given to you. It can be from a code or a party or whatever! Also, if your friends on Club Penguin asked where you got the laptop from, make sure you tell them you found it on out website! 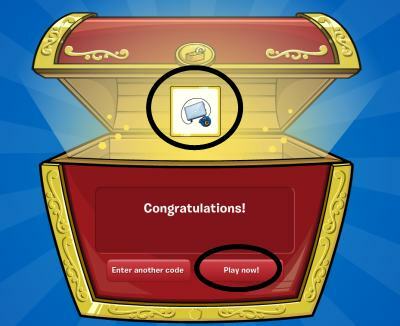 awesome this is so cool I got all new stuff from all the codes awesome!!!!!!!! !!!!!! I have used most item codes, but I was wondering if you could find some hair codes for 2013! Thanks! p.s add meeh of cp!!! Give me a Treasure Book Code!!! please?? ?